Board games are perfect for increasing the vocabulary because almost everyone knows the rules and can focus on playing – while using the target language. Apart from vocabulary skills, playing bord games helps kids develop problem solving, math skills, deduction, memory and team work. And, the games usually get the kids so busy they don’t even notice they’re learning! Any set of Scrabble tiles can be used to build simple words and sharpen the learners spelling ability and learn new words at the same time. This is a great game when we’re focusing on physical descriptions, face and body parts and pieces of clothing or accessories. The «real» Connect Four and Tic-Tac-Toe games are played in pairs, with pegs in two different colors, and the players have to connect 3 or 4 of their pegs in a streight line – horizontally, vertically or diagonally. To benefit form this fun and beloved game in language learning, we’ll have to use our own 6×7 (Connect Four) or 3×3 (Tic-Tac-Toe) grids. Our pegs can be different sets of words (like fruits and vegetables, school things and toys, clothing and body parts). The players then take turns in drwaing – or writing down – the words in the grid, until one of them manages to connect 3 – or 4 in a row. We might call this one “The” game when it comes to board games in general. It is normally played on a gameboard with numbered squares and a certain amount of “snakes” and “ladders” that connect two board games that help or hinder the players on their way from the start to the finish. Print out our board game suggestion to practice your fruits and vegetables vocabulary. To play, you will need your set of dice and figures. When a player ends on a certain fruit or vegetable, he has to name it, and for extra fun, some of them are connected with special activities. 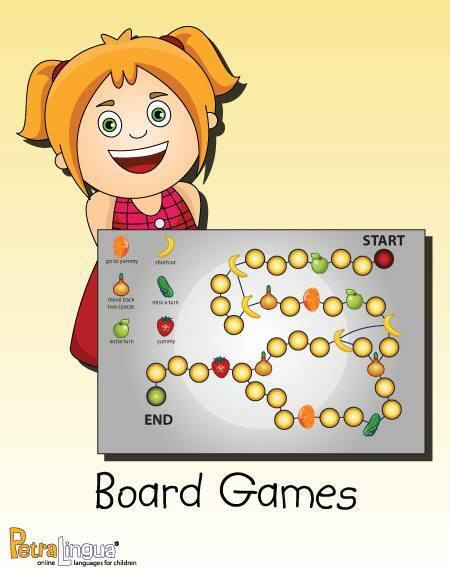 Additionally, you can decide to set up your own rules and add activities to other fruits/vegetables as well, and maybe even be more specific, just like in the previous “Snakes and Ladders” example: lemon means that you have to sing the “Days of the Week” song, a plum makes you name the furniture in the living room and carrot wants you to say what you like to eat for breakfast. Have fun playing and stop by to tell us what is your favorite board game! Join our mailing list to receive news from PetraLingua packed with information, tips and exclusive offers! Copyright © 2016. PetraLingua Publishing, all rights reserved. PetraLingua® is a registered trade mark of PetraLingua Publishing. You haven′t entered your first name! You haven′t entered your last name!